David Gergen President of Gergen’s Orthodontic Lab celebrated the New Year as a guest of Charles Barkley in Scottsdale this past weekend. The guest list was exclusive as you might expect. Roy Green from ProPlayer health alliance and Nicole Bidwill from the Arizona Cardinals were also on hand for the celebration. 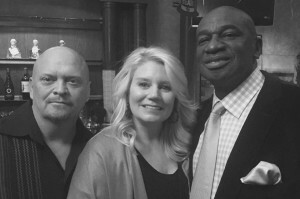 Nicole Bidwill and Roy Green go way back, Nicole was 11 years old when her father’s NFL team, then known as the St. Louis Cardinals, drafted Roy Green as a kick returner and defensive back. It was great to see old friends spending time together. David Gergen is particularly busy this month in his position as executive dental director of the American Sleep and Breathing Academy. There is a big push to get ready for the ASBA Diplomacy program the review course is February 5th and 6th so there are lots of calls to make and preparations to attend to. Charles Barkley has recently taken a keen interest in obstructive sleep apnea. He even agreed to appear on the cover of Sleep and Wellness a magazine dedicated to providing sleep apnea education to the general public. The impact of sleep apnea on the health and wellness of the general public is well understood. Conditions that are affected by sleep apnea include diabetes, heart disease and obesity. Gergen’s Orthodontic Lab is making sure that our Dentists have a very successful year helping their patients with sleep apnea oral appliances (MAD’s). Attending from the ASBA with David Gergen and Randy Clare were retired NFL great and OSA evangelist Roy Green and Miriam Hussein from Pro Player Health Alliance, everyone was having a great time at the party.